SIDS is the sudden death of a baby after being put to sleep and shows no signs of suffering. It cannot be predicted by medical history and cannot be explained by an autopsy. The term SUDI is also used because it is a sudden unexpected death in infancy. 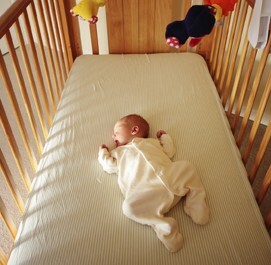 SIDS is also referred to as cot death or crib death. Prevention strategies include safe sleeping practices. Such as placing the baby on it's back or stomach, in a well-ventilated room, on a firm mattress, seperated, but close to parent or caregiver. Giving the baby pacifiers at night time and before nap time can help. Also, not smoking during pregnany will help reduce the risk. Experts advise against pillows, overly soft mattresses, sleep positioners, bumpers, and stuffed animals. You want to keep the crib "naked" instead of dressed warmly. Also, babies should not share beds. A study published in 2003 invenstigated that babies that are breast fed are 1/5 the rate of SIDS. However, more recent studies say that breast feeding reduces the risk of sudden death.